When watching live circus, I often find myself holding my breath. I get caught up in the riskiness of the act. My instinct to breathe disappears, squeezed out by the combination of sympathetic fear and hope for the performer. Then when I do remember to catch some air, it’s usually sucked into my lungs in order to whoop and holler my appreciation at the successful completion of a stunt. 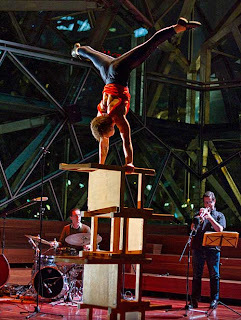 This was certainly the case when I saw the premiere of Inform, a truly synergistic performance for jazz quartet and circus artist. 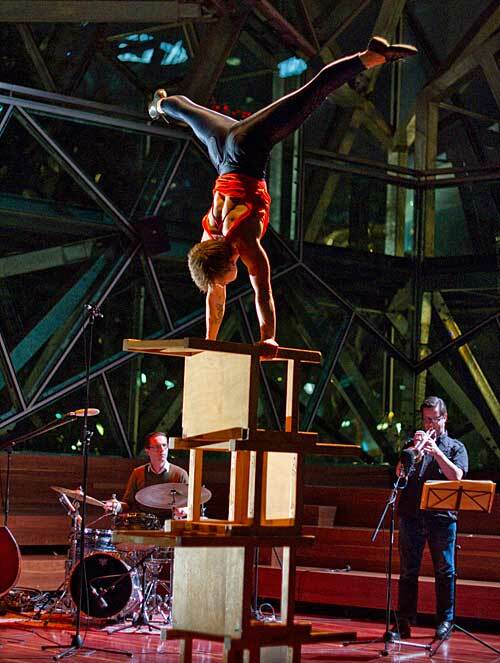 Rockie Stone has been performing circus for quite a while, with Circus Oz amongst others. Her material hasn’t changed substantially, but years of hard work have lent her an elastic strength and quietly assured presence, not to mention several flawless routines. Whether in an inverted balance atop a stack of chairs, or making the corde lisse look as sturdy as a pole, her skills are silky smooth. In Inform, Stone’s physical dexterity was impeccably matched by joyously resonant sound composed by Fran Swinn. Standing to one side of the stage, the responsive and varied jazz/pop numbers were performed live by the Fran Swinn trio, with the addition of special guest trumpeter Eugene Ball. Interesting textures and rhythms combined with soulful tunes made it not only immensely enjoyable to listen to, but carefully crafted to meet the pitch of Stone’s contribution. Particularly satisfying was the way each element made space for and enhanced the other. When suspense was called for, Swinn provided it subtly but persuasively. When the music wanted our attention, Stone faded to stillness. It’s a simple concept which was deftly arranged and executed brilliantly. Inform brought out the best of both music and circus, presenting a closely knit collaboration which was surprising, exciting and beautiful. I held my breath, and hollered.